The Minnesota-led Clear Roads winter maintenance research program has developed a set of training tools—two videos and two quick reference guides—to promote liquid roadway treatments and provide practical guidance for agencies implementing a liquid anti-icing/deicing program. Many agencies use liquids such as salt brine as anti-icing treatments to prevent ice from forming on roadways. But the application of salt brine as a deicing treatment during or after a winter storm has been slower to catch on. When used in the right conditions, liquid deicing treatments are as effective as granular sodium chloride while using less salt, but liquid-only routes are used by only a minority of winter maintenance agencies. To get the word out about the benefits of using salt brine and other liquids as both anti-icing and deicing treatments, as well as provide practical information about liquid application procedures, Clear Roads initiated this project. While there is a wide range of information available about the use of brine and other liquids for anti-icing and deicing, there was a need to offer clear, comprehensive guidance in a single resource and to provide training tools for implementation. A 2010 Clear Roads project helped lay the groundwork for this effort by identifying the parameters for effective implementation of liquid-only plow routes. That project produced a quick reference guide that outlined the conditions when liquid deicing treatments are most effective and provided application rates and implementation recommendations. A follow-up study was needed to update this guidance and to develop tools to facilitate the implementation of liquid-only plow routes. • Inform agency decision-makers and the general public about the benefits of liquid roadway treatments while dispelling common myths. • Provide practical guidance for maintenance managers and plow operators, and for agencies looking to start a liquid-only program. Researchers began by conducting a literature review of research and practices related to liquid-only plow routes. They then sent an online survey to agencies in 27 states to determine which agencies used liquid-only roadway treatments. The survey yielded 92 responses from state DOTs and county and municipal highway departments. Follow-up interviews with 14 survey respondents gathered information about types of roads where liquid-only routes are used, application rates and material usage, brine making and storage, cycle times and loading times, and public perception and environmental concerns. A shorter video for agency decision-makers and the general public that discusses the benefits of liquid-only treatments while addressing common misconceptions (particularly misinformation about corrosion and salts in the environment). A full-length video for practitioners that includes information from the short video as well as tips for starting a liquid-only program, discussion of equipment types, and recommended usage parameters and application rates. To complement the videos, researchers created two 2-page quick reference guides—a Start-Up Reference Guide to help agencies gain buy-in for a liquid-only program and a Technical Reference Guide with more detailed usage parameters, application rates and general tips. “To effectively get the word out about liquid-only road treatments, there was a need to put the right message in front of the right audience in a compelling way and to dispel myths and misconceptions. These guides and videos do just that,” said Project Co-Champion, Scott Lucas, Ohio Department of Transportation. Appropriate use: Liquids are especially effective during light snowfalls and at milder temperatures. 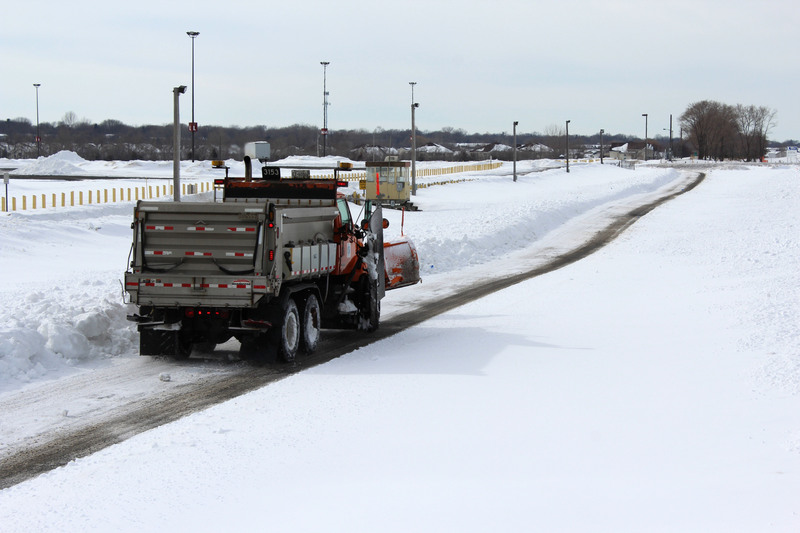 Agencies also use liquids to loosen packed snow for plowing; during high winds when granular salt may blow off the roadway; and as anti-icing treatments before freezing rain. Benefits: Liquid deicing treatments use less salt, which leads to cost savings and reduced environmental impact. Liquids begin to work immediately, and they stay on the roadway (no bounce or scatter). Misconceptions: Liquid applications of salt brine do not cause more corrosion damage to vehicles than granular salt. Granular salt must dissolve into brine on the roadway in order to melt snow and ice, so either approach exposes vehicles to salt brine. Corrosion inhibitors can help; some studies show they are more effective with liquids than solids. This post pertains to Liquid Roadway Treatments: Informational and Training Videos, published November 2018. The full report, videos and final presentation can be accessed at 16-06: Training Video for the Implementation of Liquid-Only Plow Routes. 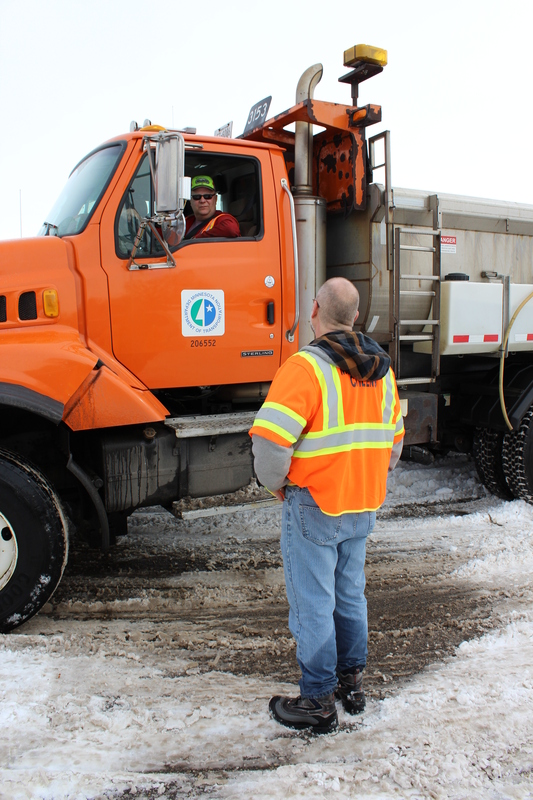 This winter, MnDOT snowplow operators will test and document their experience using potassium acetate (KAc) during severely cold weather as a possible alternative to the commonly used deicing material sodium chloride. MnDOT maintenance staff have used potassium acetate in the Duluth area as a deicing alternative in several locations (Bong Bridge, Blatnik Bridge, I-35 tunnels, and I-35 at Thompson Hill) with anecdotal success. Advantages of KAc include reducing chlorides runoff into water, a lower effective deicing temperature (approximately -20F) than salt or brine, and less corrosion to vehicles and public infrastructure. KAc will be used on four plows at select locations in the MnDOT District 1 Duluth sub-area. Crews will document the effectiveness of KAc in removing snow and ice pack at temperatures of minus 15 to 20 degrees Fahrenheit and reducing the time it takes plows to achieve and maintain bare pavement during severely cold temperatures. In addition to evaluating potassium acetate as an alternative de-icing chemical, researchers will develop application guidelines and material handling requirements. Researchers from CTC & Associates will review the 2018 Transportation Research Syntheses, Field Usage of Alternative Deicers for Snow and Ice Control, and identify any additional information that is publicly available regarding national and international use of KAc as a de-icing and anti-icing agent. The focus will be on successful uses of the material (material concentration and application rates, weather conditions, timing, etc.) by highway agencies or transferable practices by airports. MnDOT District 1 personnel will conduct field tests of KAc on selected plow routes during the winter of 2018-2019 and document key data about the amount of material used, locations, equipment, storm characteristics, pavement conditions and other elements. Researchers will assist MnDOT with the design of the field study, the creation of a data gathering tools to be used by plow drivers, monitoring of data quality during the study, analysis of data gathered during the winter season, and writing a report presenting the study conclusions. Watch for new developments on this project. Other Minnesota transportation research can be found at MnDOT.gov/research. The accumulation of chloride in our waters has become a widespread concern. In a recent study sponsored by MnDOT and the Local Road Research Board, researchers measured the transport and accumulation of chloride from road deicers in a metro-area watershed. The findings revealed a greater infiltration of chlorides into soil and subsurface waters than previously assumed. standards, and a recent study showed that levels in more than one-quarter of shallow groundwater wells in the metro were above drinking-water taste standards. “This is a real concern because even in low concentrations, chloride can be lethal to sensitive plants and some aquatic species, and many of our lakes, wetlands, and streams show acute or chronic levels of chloride,” Herb says. To learn how chlorides from road salt deicers are transported in urban watersheds, researchers installed field instruments at eight sites in a Roseville watershed. They monitored water and chloride levels nearly continuously over three winter seasons; this included runoff directly from sources (roads and parking lots), transport in ditches and sewer networks, and retention in and release from detention ponds and wetlands. Computer modeling was used to generalize results. This drain along State Highway 36 was one of the roadway runoff discharge sources used in the study. from the ditch into the soil, and less than 5 percent was exported from the site in surface runoff. “Interestingly, substantial chloride export from the ditch was observed in November rainfall runoff prior to application of any new road salt for the upcoming winter, suggesting long-term storage in soils and groundwater in and near the ditch,” Herb says. prolonged thaw each season moved surface chlorides most effectively into the watershed. The research team then used the data and modeling to examine potential strategies for reducing or mitigating the spread of chloride, including capturing low flows, seasonal runoff capture, and capture based on salinity. This article originally appeared in CTSs Catalyst Newsletter, March 2018 and pertains to Technical Summary 2017-50TS. The full report, “Study of De-icing Salt Accumulation and Transport Through a Watershed” 2017-50, published December 2017 can be accessed at mndot.gov/research/reports/2017/201750.pdf. Excalibur and the High Roller may be closed for the season, but Valleyfair Amusement Park still has one attraction open for the season: a driving track for Minnesota snowplow drivers. MnDOT-funded researchers are studying the effects of weather and vehicle traffic on different deicing treatments in the parking lots of Valleyfair and Canterbury Park in Shakopee, Minn.
It’s been a busy winter, but each week MnDOT Metro District snowplow drivers make one last stop before heading home, to apply different combinations of salt and anti-icing chemicals to nine 1,000-foot driving lanes. They also drive over each lane multiple times to test the effect of traffic. Professor Steve Druschel speaks with MnDOT snowplow driver John Hokkanen. Professor Druschel’s students will review more than 17,000 photos from time-lapsed cameras to document how the snow melted in each experimental run. “The influence of factors like pavement type and age, traffic volume, truck proportion, weather conditions and sun presence will be assessed to evaluate which techniques have special advantages for certain situations or roadways,” said Maintenance Research and Training Engineer Tom Peters. In 2010, Druschel tested 25 anti-icing compounds in 1,500 different combinations in a laboratory to study the effectiveness of different deicers. With rock salt prices quadrupled, finding the most cost-effective methods of treatment is important. This latest research will help determine the best times for applying anti-icing treatments and examine whether certain chemicals — such as a pre-storm liquid treatment that costs twice as much — melt enough snow to be worth the extra cost. Test runs in Shakopee are strictly experimental, but in Mankato students are analyzing how real-world salting treatments are working on the North Star Bridge. Students plan to use time-lapsed photos, along with weather data and snowplow records, to determine what chemical treatments worked best – and when. With the multi-pronged research project, Druschel hopes to put definitiveness to what some snowplow drivers have already tried in the field. Even naturally derived products like corn syrup and beet juice can impact the environment when applied to salt mixtures for winter roadways. A wide range of products, including the ones mentioned above, are added to deicing mixes to limit the amount of salt needed for Minnesota roads each winter. However, although information is available about the corrosive properties of various deicing chemicals, less is known about the toxicity of these compounds, especially to the aquatic environment. Thanks to a recently completed project sponsored by the Clear Roads Pooled Fund, MnDOT winter maintenance personnel will better understand the relative toxicity of eight common deicing agents, which also include non-organics like Magnesium Chloride, Calcium Chloride and Potassium Acetate. “Because the state has been trying a lot of different alternative chemicals, we wanted to get a better handle on the environmental impacts,” said MnDOT engineer Tom Peters, the technical liaison for the 26-member, Minnesota-led pooled fund for winter maintenance research. In January, researchers plan to release a concise summary of the toxicity rankings to help winter highway maintenance managers consider both expected levels of service and potential harm to the environment when selecting a deicer. A Dec. 3 webinar available on the Clear Roads website discusses their findings. Minnesota is the lead state for the Clear Roads Pooled Fund, which conducts rigorous testing of winter maintenance materials, equipment and techniques. Other recent and upcoming research (see our Technical Summary on the program) includes a winter maintenance cost-benefit analysis toolkit, snow removal techniques at extreme temperatures and environmental factors that can cause fatigue in snowplow operators. You can learn more about Clear Roads via the project’s e-newsletter.